Late 19th-early 20th century winter landscape / snow scene, by Alois Arnegger oil on canvas. 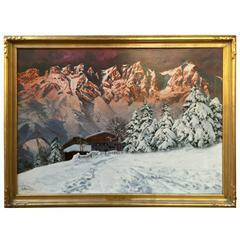 Signed A. Arnegger Measures: Height 31" x width 43" Alois Arnegger was an Austrian scene painter, best known for his romantic landscapes of rural life and architecture along the Mediterranean coast. Born on March 9, 1879 in Vienna, Austria, Arnegger studied under academic and historical painters such as Robert Russ at the Academy of Fine Arts Vienna. The constant change in seasonal and climatic variations of the rural regions intrigued Arnegger, who painted the same subjects over and over in different weather and conditions. Later in his life, Arnegger returned to his homeland of Austria where he continued to paint landscapes and Alpine scenes. 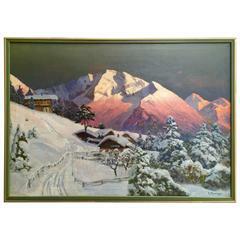 Arnegger was best know for his beautiful sunset Alpine snow scenes. His works have sold in galleries around the world including New York, Stuttgart, Vienna, Amsterdam, Paris, Stockholm, Munich and Chicago. 18th century very large and impressive pair of French / Continental painted oil on canvas panels. Measures: Height 8 feet 2" Width 8 feet 10". Late 20th century semi-abstract surreal painting by Dale Atkinson, framed. Please contact for international delivery options. Beautiful winter landscape with snow. 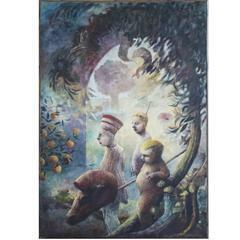 Oil on canvas made in the early decades of the 20th century. Including of frame.